The new starting point Lenggries gives this classic a different character. 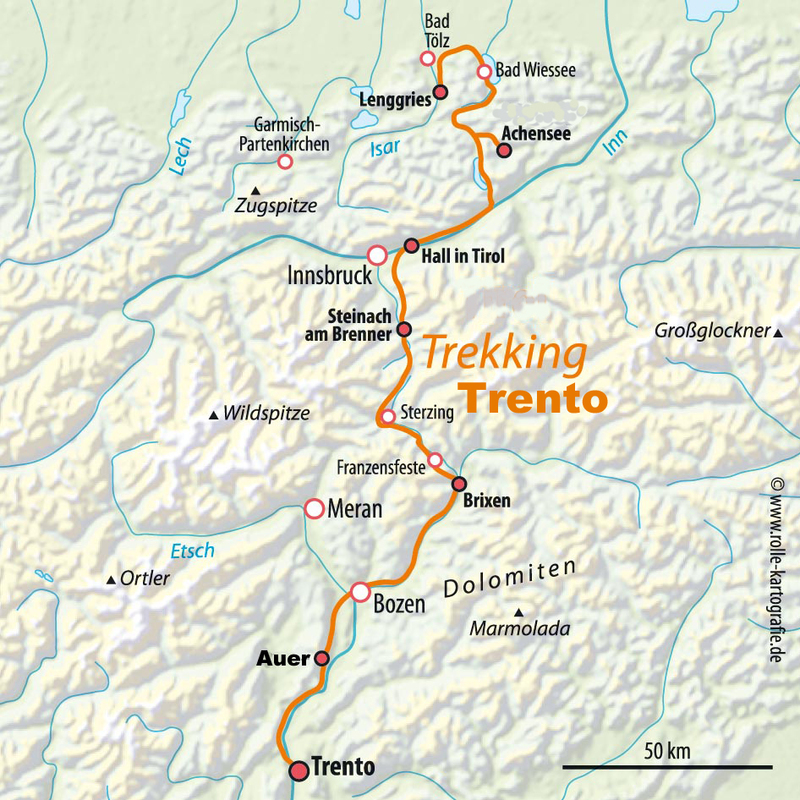 We will cross the Alps on secondary roads along ancient trade routes on our way to Trento. The route features both historical and alpine highlights along the way. Our Transalp Trekking Tyrol starts in the beautiful Bavarian Alps, crosses over via Lake Achen down to the Inn Valley, and then heads for South Tyrol. A really special tour. The landscape around the Tegernsee is rightly considered among the most beautiful in Germany. We will ride past the mansions of the super-rich and head directly into an almost pristine mountain landscape. We'll quickly leave the Achenpass behind us. Overnight accommodations in a secluded designer hotel surrounded by giant peaks. In the clear morning sun, Lake Achen shines like a mountain crystal. The whistling of the old Achensee Railway accompanies us down to the Inn valley. The historic old town of the once powerful trading city Hall is worth the trip by itself. Appropriately, we'll spend the night behind old walls. The main Alpine ridge is within our grasp. We will ascend in two stages. Soon, the legendary Europa bridge lies far below us and we'll look upon the Stubai glacier's eternal ice. Quaint inns and old milestones highlight the historical importance of what has always been an important trade route. Overnight stay in Steinach. In the morning, we'll head for the lonely mountains. Our objective is to conquer the main Alpine ridge. Once we reach the Brenner Pass, we've done it. From now on it's mostly downhill. We'll stay the night in the old town of Brixen in modern rooms which offer a view of the Pope's summer residence. Today will be both wild and quaint. The mighty railway tunnels are reserved exclusively for cyclists. The Eisack river thunders beneath us and the rock walls close in on us. Afterwards, we'll ride through vineyards and past castles towards Lake Kaltern and our destination Auer. Multi-course dinner. Today, we'll experience South Tyrolean wine in a very different manner. We will cycle through splendid vineyards and ancient wine villages. In the episcopal city of Trento, steeped in history, our dream Transalp will find its proper conclusion with a stylish overnight stay in a chic city hotel. After the breakfast, the bikes are loaded onto the bus. Return trip by bus back to Lenggries. Upon arrival, everyone travels home individually. Markus Walch, ALPS bike guide for the Transalp Trekking Trento and Trekking Engadine. Arrival: Arrival by car or train to Lenggries/Germany. Type of route: Bike paths, asphalt secondary roads and easy gravel roads. Included in the price: Guided tour with 7 overnight stays and half board (breakfast buffet, multi-course dinner menus) in mostly 4-star hotels in a double room, often with wellness areas. Luggage transport, return transfer in a comfortable bus.